Sea Trout Papaya with Stuffed Zucchini a la Hatteras. ON THE ROAD Last week I wandered about a bit in the Hatteras area. Despite the arctic cold wind, the sun was warming to my bones. Meandering through many small towns I observed the emergency actions taken by homeowners to defray the cold. Blankets on car engines with a night light, clear plastic stapled over windows, and hay bales around red brick foundations. A house banner—you know, those little flags people hang out on small flag poles to charm passersby— simply announced the arctic weather with a graphic of an old pair of ice skates. Gees Louise! They must have dug deep to find that one in the attic! I pulled out two Clara Bartons and laid them on his open palm, he tossed ’em and caught em’ replied “Fair enough!” and I had some fresh trout for my dinner! A great winter recipe, delicious from my home repetoir, improvised for cooking in my tiny trailer kitchen, with an electric toaster-oven. Sea Trout Papaya with Stuffed Zucchini. Fish: Wash the trout, fillet with sharp knife by cutting meat along side the spine downward toward the belly. Take care not to cut the rib bones but be guided along the bones in one long cut the length of the fish above the ribcage saving* just the meat. See photos below. Fillet stages: The second side is a little more difficult. *The fish carcass can make an excellent soup. Place it in a pan of warm water and set aside. Sea Trout Soup recipe soon! Make a three fold cooking sheet of aluminum foil curling the edges to prevent spilling. Place the meat skin-side down on the foil. Drizzle the juice of half a lemon on top and set aside to marinate. Chop up 1/2 cup of skinned and deseeded papaya meat in a small bowl then add a tablespoon of lemon juice and a a dash of the fresh grated ginger, set aside to marinate. is a little softer/creamier than bird stuffing. Turn down heat to low low. Place the hollowed out squash shells in a small baking dish or some folded foil, fill the squash cavities with the stuffing. Grate some Parmegiana cheese on top. Bake for 45 minutes or until the squash shell is soft and the stuffing is browned. Zucchini and fish ready to cook. It is a little tricky to time this but the the Zucchini will be done in about 45 minutes. Then you keep it warm with an aluminum foil cover while you cook the fish. 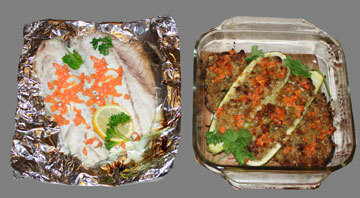 In the toaster-oven the fish cook best when baked for 10 then top broiled for 5 min. Check the fish for flaky soft with a fork, no pink. Garnishh with parsley if you have it, a slice of lemon and sprinkle some marinated Papaya on the fish for serving. Mana from heaven, this is delicious believe me.